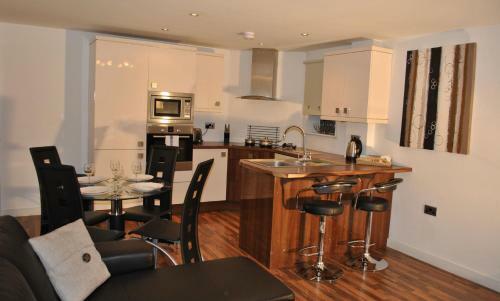 Lock in a great price for Dreamhouse Apartments Manchester City West – rated 8.9 by recent guests! Dreamhouse Apartments Manchester City West This rating is a reflection of how the property compares to the industry standard when it comes to price, facilities and services available. It's based on a self-evaluation by the property. Use this rating to help choose your stay! Each apartment at the Dreamhouse Manchester City West has a spacious living area, featuring a Samsung 40-inch LCD TV, with Freeview cable and digital radio channels. The apartments have modern kitchen facilities including a washing machine/dryer, dishwasher, oven and microwave. There is a communal terrace with patio furniture. 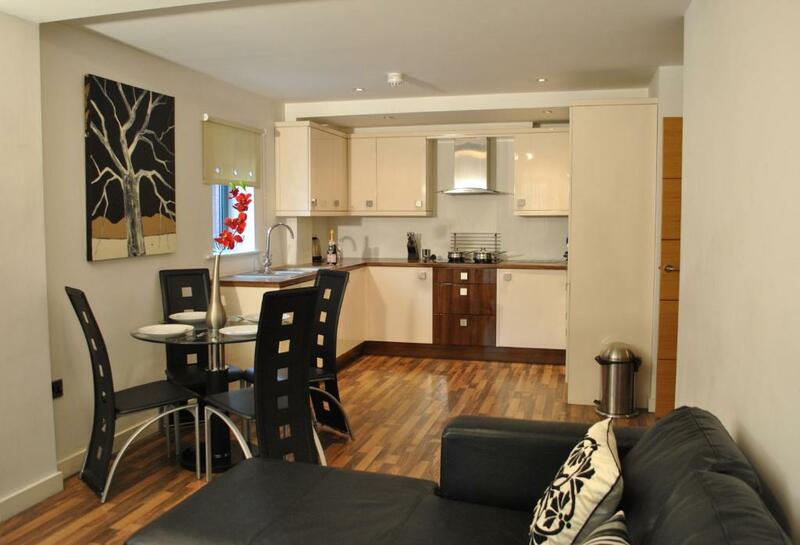 Spacious apartments with a full kitchen, living room and dining area. There are 2 double bedrooms, an en suite shower room and a family bathroom with a shower and bath. Some apartments also benefit from a private balcony. The living area has 40-inch white LCD TV with Freeview. 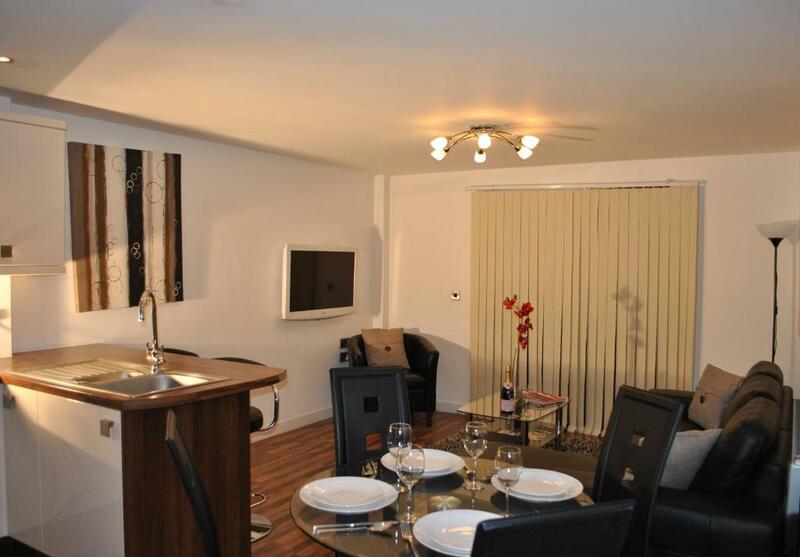 The spacious apartment has a full kitchen, living room and dining area. There are 2 double bedrooms, one with a bathroom with a shower, and a separate family bathroom with a bathtub and shower. This room has a private roof-terrace, a 40-inch flat-screen TV in the master bedroom and a free-standing bath. The living area has 40-inch white LCD TV with Freeview cable channels. 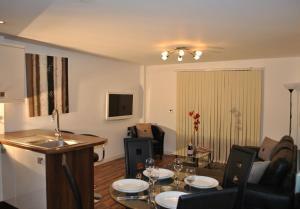 A luxury apartment with 1 double bedroom, 2 bathrooms and an open plan living area with dining table and a kitchen. Free Wi-Fi is available through out property. Guests can also access the communal top floor terrace. Some apartments have a private balcony. Spacious apartments with a fully-equipped kitchen, living room and dining area. There are 2 double bedrooms, an en suite shower room and a family bathroom with a shower and bath. The living area has 40-inch white LCD TV with Freeview. Some apartments also benefit from a private balcony. Spacious apartment with a fully-equipped kitchen, living room and dining area. There are 2 double bedrooms, one with a shower room, and a separate family bathroom with a bath and shower. With a private roof-terrace, a 40-inch flat-screen TV in the master bedroom and a free-standing bath. The living area has 40-inch white LCD TV with freeview channels. House Rules Dreamhouse Apartments Manchester City West takes special requests – add in the next step! Please also provide a mobile telephone number on which you can be contacted while traveling. Please inform Dreamhouse Apartments Manchester City West of your expected arrival time in advance. You can use the Special Requests box when booking, or contact the property directly using the contact details in your confirmation.